Dimensions : 103 h x 55 w x 51.5 d cm. 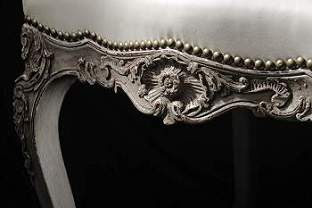 The tendency towards Rocaille carving and the Regence Chair taste reigning in Europe due to the influence of the antique french furniture high style can be seen in the carving of the rails, but this very french chair is totally loyal to the magnificent french style which makes it so up-to-date. The legs, carved with claws, are superb . 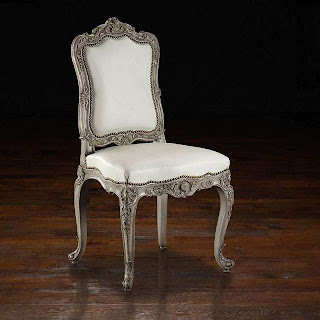 In its tapestry upholstered version, the additional comfort makes the carving slightly less noticeable on this great comfortable chair.